There are over 2,000 varieties of quinoa. It is an herbaceous plant in the Chenopodiaceaefamily of which the seeds are harvested after maturation: it is not a cereal! The Native Altiplano Americans call this plant chisiya mama (in Quechua, "the mother of all grains") and consider it sacred as well as a symbol of the Earth's fertility. After Spanish colonisation and the destruction of the traditional agricultural system, quinoa crops almost died out until recently when Bolivian and French researchers, amongst others, dedicated themselves to promoting it. Bolivia: an experimental, standardised agricultural system comparing ten varieties of quinoa was created in 2003 in partnership with two university agriculture departments in the Molivian Altiplano, for research, training and development. The French Public Research Institute (IRD) and Bolivian partners dispensed participatory training days at different levels of university studies. Shown here are quinoa panicles. The plant can grow to heights of up to 2 m and is grown on the Bolivian Altiplano at an altitude of 3,000 metres. 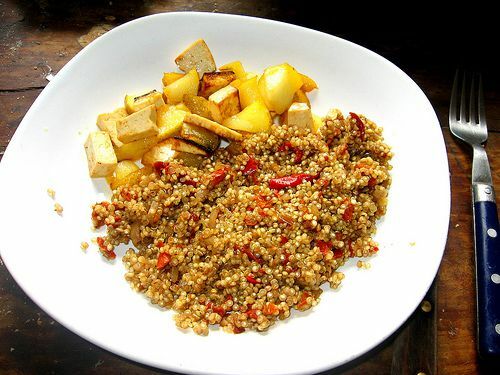 For a long time quinoa was the daily staple of the Incas. Today it appears to be a possible solution to the world's hunger problem as it has exceptional nutritional value. Quinoa plays a primordial economic and dietary role in certain regions of Bolivia and elsewhere. Quinoa has major climatic constraints : especially frost and drought. In some areas the development of agricultural practices has led to ecosystem changes which are not always beneficial. Quinoa panicles, milky toledo rojo seeds. On the Altiplano, a high plateau located at an altitude of between 3,600 and 4,300 metres, the research programme has developed an experimental agricultural network for quinoa, a pseudo-cereal which is generating growing interest as an organic, high protein content export to Europe and North America. J.P.Raffaillac from the IRD, has researched this subject : "The work is on the identification of new plant cover conditions adapted to the physical limits of agro-ecosystems undergoing rapid change" (general objective of the UR CLIFA). modelling growing, cover and remote detection. sustainability of the organic quinoa crop system in the Southern Altiplano. monitoring for caterpillar attacks during the growing season. and for export it must be washed, dried, sifted and packed in a cooperative factory. Its straw is used as fodder for llamas.